Probe is a visual performance monitor for TouchDesigner processes, measuring CPU times (circles), and GPU times (diamonds), plus, via the selector on the left, CPU memory, GPU memory and the number of children in a component. 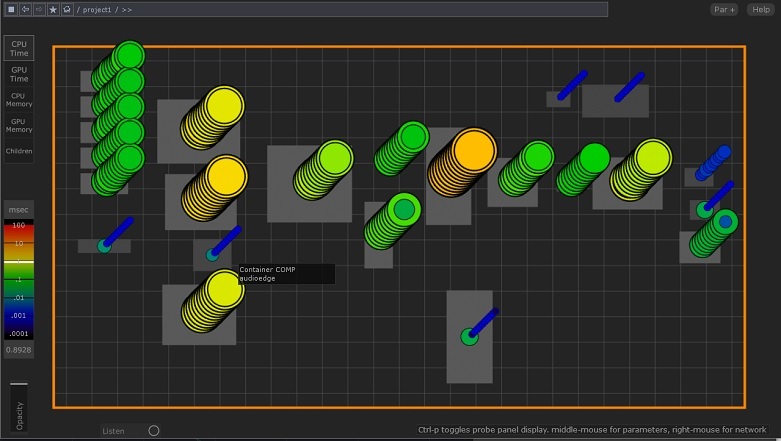 Drag-drop the probe component from the Palette anywhere in your TouchDesigner process, preferably in /. Pressing Ctrl-p will display and un-display the probe panel: You will be able to see the probe when you are in Designer Mode as a floating window, or in Perform Mode. In Perform Mode it is a panel embedded in your main UI (to minumize effect of having 2 windows open). The probe panel looks a bit like your network. For CPU Times, each stack of circles represents the recent time-history of a node. There is one stack for every node in your current network. The color and size of the circles gives the cook time... use the color legend at the bottom left, expressed in milliseconds. Each stack is 10 circles, the top being the most recent Time Slice that cooked, the bottom being the tenth most-recent Time Slice. However if a node hasn't cooked in the last 10 time slices, the bottom circle represents the most recent time it actually cooked. Navigate the networks by left-clicking on a node's box, if it is a component. Click on the background to go up the network hierarchy. Middle click on the node to bring up its parameter dialog. Right-click on a node to bring up another window containing the network editor for that node. The stacks that look like donuts or Tootsie Roll (USA) that have a circle within a circle are components. The inner circle represents the children cooking inside the component, the outer circle representing the sum of the node's cook time and its children's cook time. The large colored box around all the nodes represents, through its color, the cook time of all the nodes in the network, including all children. Rolling over a node or stack will show the numeric value of the metric, and in the spectrum graphic on the left (the white line shows the value of the current node's metric, otherwise the parent's value). Click on "GPU Time" to get GPU times, etc. Memory is expressed in Megabytes. This component consumes its own minimal cook time, sometimes up to a few milliseconds, so it will slow your process down a bit when it is being displayed. Undilplaying it (Ctrl-P) stops all cooking of Probe. This page was last edited on 19 September 2018, at 00:05.